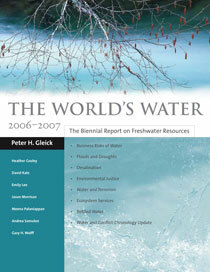 The book contains an updated chronology of global conflicts associated with water as well as an assessment of recent water conferences, including the 4th World Water Forum. It also offers a brief review of issues surrounding the use of bottled water and the possible existence of water on Mars. From one of the world's leading authorities on water issues, The World's Water is the most comprehensive and up-to-date source of information and analysis on freshwater resources and the political, economic, scientific, and technological issues associated with them. "…both an excellent reference work and intriguing general introduction." "[The World's Water] contains an enormous amount of information on water in addition to cogent analysis of complex systems…an excellent source of data…simply invaluable as a reference..."
"Peter Gleick skillfully brings together wide-ranging historical, scientific, technical, institutional, and legal information about key factors and trends affecting water availability and quality around the world…We should look forward with anticipation to Gleick's next biennial review." "…an excellent resource for those seeking to gain a grasp of this complex topic." "The publication of these reports is a major event in the world of water." -An Overview of the "Water Industry"